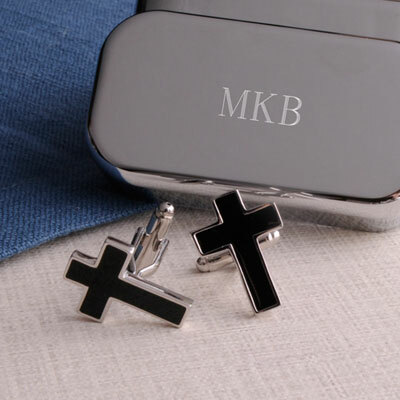 A plain and simple symbol of faith, these Black Cross-shaped Cufflinks with Personalized Case are an excellent gift for the believer. Black with a silver outline, they are packaged in a handsome lightweight plated polymer case with black satin lining. Great gift for groomsmen or anyone celebrating a religious occasion! Case measures 3" x 1 1/8" x 1 1/2". Personalize the case with two lines of up to 15 characters per line. Case measures 3" x 1 1/8" x 1 1/2"